This is the first of the monthly desktop wallpaper calendars I’ll be offering on Portraits of Animals each month. These wallpaper calendars for computers and mobile devices have been a favorite feature for almost five years on The Creative Cat featuring my variety in feline artwork and the occasional photo. 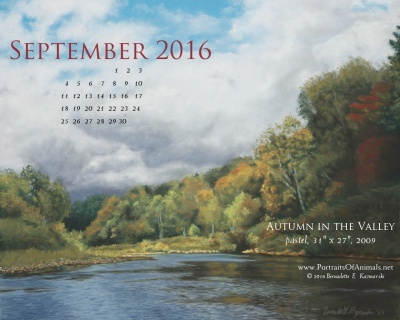 The calendars are always themed by the month, and the art will vary from a detailed landscape like “Autumn in the Valley” to simple en plein air sketches, to wildlife, waterscapes and florals, and pastels and watercolors and charcoals and photos of the same subjects. I usually post the desktop wallpaper calendars here on the blog on or before the first of the month, and they will also be available at the top of the right column on the blog page and on individual product pages. The featured artwork also becomes one of the New Member Gifts for the month it’s featured as well, so if you’ve been waiting to register for an account, here’s another good reason. Your Autumn in the Valley, Pastel, New Member Gift print is 8″ x 11″ and matted to fit an 11″ x 14″ frame with a pure white mat. You can order other prints of this artwork as well on paper and canvas. Sloping hills blaze with autumn color at a rocky, rippled bend in Chartiers Creek, yet on the horizon deep gray-purple clouds hover; although the day was sunny I remember it being distinctly chilly with a sharpness to the breeze, especially on the water in a canoe, and winter is literally on the horizon. For two reasons the scene was reminiscent and inspiring: first, that I rounded the bend to see this natural splendor in all its detail, brilliant color, fluttering leaves, rippling water, changing clouds, happening all on its own with no help from me or any other human; and, second, it was an example of that “change of season” with the gray-purple clouds of winter arriving on the horizon, two seasons blending into one another. I needed to share this image, and it was so moving that the inspiration also became a poem, and the title for my third annual poetry reading and art show at Andrew Carnegie Free Library & Music Hall, Change of Season. 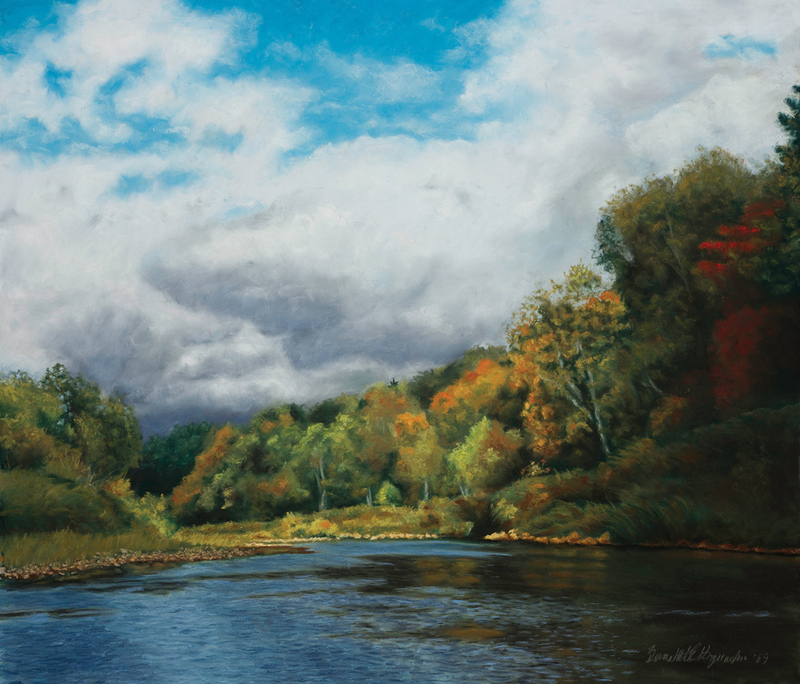 No, I couldn’t paint while paddling, and my little digital photos didn’t do the scene justice, yet other than wading down the creek and setting up an easel in the middle of the water, there was no other way of painting this. To take the scene from the tiny digital image to the full-size painting took a good bit of memory and visualization; it’s a good thing I’m very familiar with scenes like this. Hope you enjoy it this month! And don’t forget to register for an account and get a free matted print of this painting or choose from several other sketches, paintings or photos of other subjects. “Autumn in the Valley” desktop calendar 2560 x 1440 for HD and wide screens. 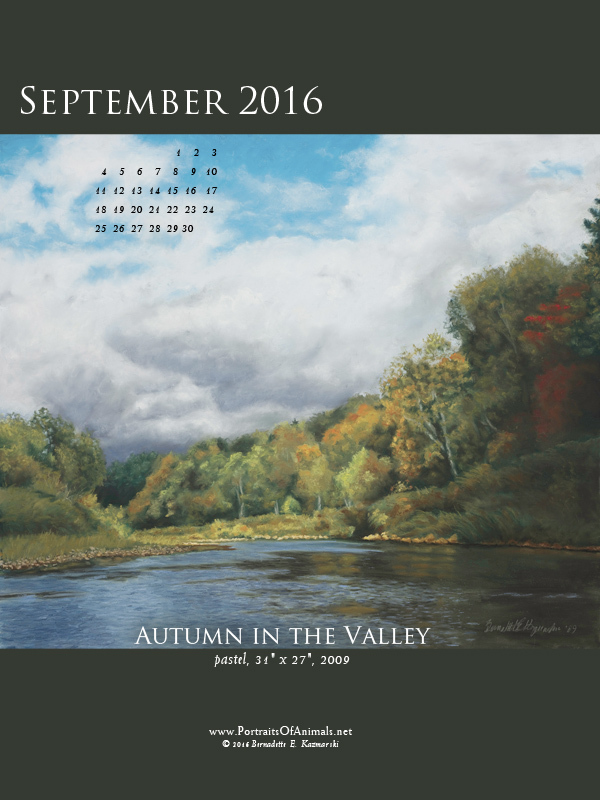 “Autumn in the Valley” desktop calendar, 1280 x 1024 for square and laptop monitors. “Autumn inthe Valley” desktop calendar, 600 x 800 for iPad, Kindle and other readers. 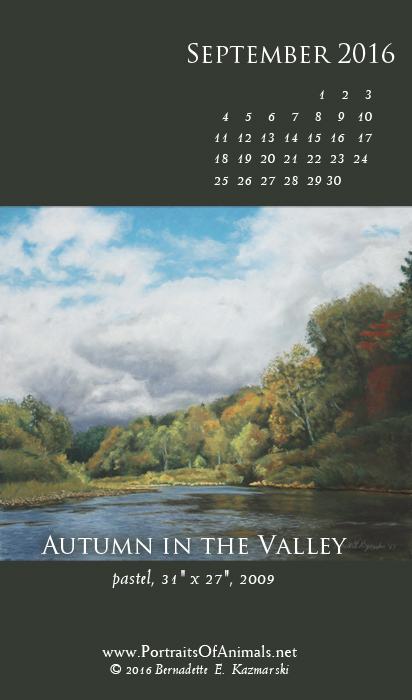 “Autumn int he Valley” desktop calendar, for 400 x 712 for mobile phones. This is the first desktop wallpaper calendar, so the above link will be active when I post another. 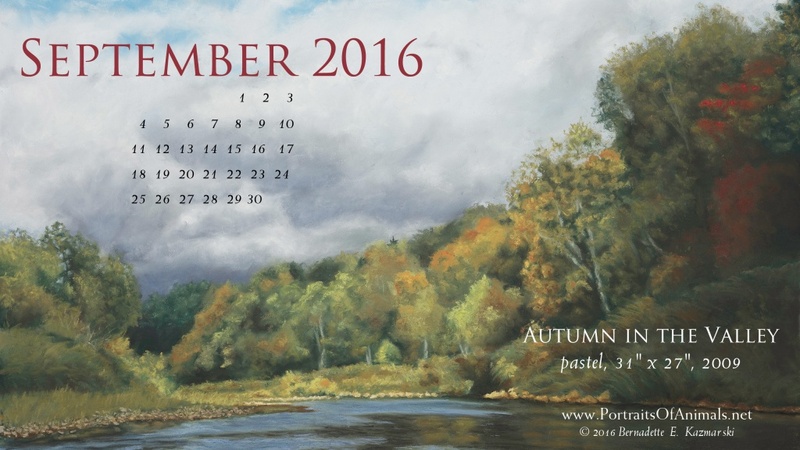 This entry was posted in Desktop Nature Calendar, Desktop Wallpaper Calendar and tagged AUTUMN, desktop calendar, desktop wallpaper calendar, landscapoe, pastel on September 3, 2016 by Bernadette.